When you’re in need of a new family vehicle in Marlton, Mount Laurel, or Cherry Hill, there are several great vehicles you could choose for your family. However, for most, the tried and true option is driving a minivan, and one of the top vehicles in this exciting class is the new Honda Odyssey. The newest Odyssey is set to redefine the minivan class, offering a variety of world-class features and the outstanding performance that consumers expect from a Honda. Here is a review of the most thrilling features of the 2018 Honda Odyssey that will make you want to drive this minivan around your town. There are a lot of features that you need to consider when purchasing a vehicle for your family, but the most important is how much comfort and flexibility you’ll have in your vehicle’s cabin. Luckily, with the new Odyssey, you’ll have fantastic options for both passenger comfort and cargo storage. Thanks to the Magic-Slide 2nd-Row Seats™, you’ll easily be able to get to your third-row, making it a breeze to seat up to eight passengers. If you’re worried about cargo space, never fear, because the Odyssey offers a large floor that will easily fulfill your storage needs. Having the right technology features is another crucial part of choosing a family automobile. After all, on those long road trips, you want to make sure that your children are entertained from the minute you pull out of your driveway to the moment you return home. Inside of the 2018 Honda Odyssey, you’ll find a wide range of tech features that were designed with families in mind. With the CabinWatch™ System, you can view your rear seats to keep an eye on your kids. There is also an Advanced Rear Entertainment System that’s perfect for listening to music or watching videos. Finally, available CabinTalk™ lets front and rear seat passengers easily communicate. 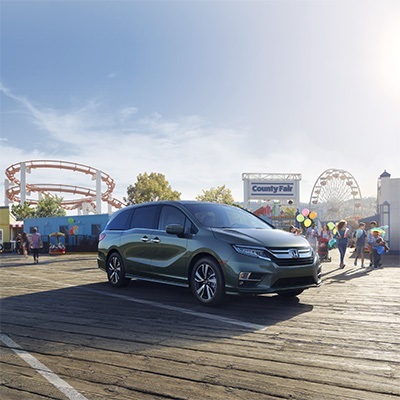 When most families are choosing a new vehicle, their primary focus is finding a model that is completely safe, which is one of the top advantages of driving the Odyssey. With this minivan, you and your children will be protected by Honda Sensing®, one of the best safety suites in any vehicle. 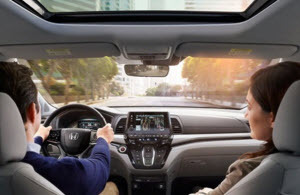 Honda Sensing® offers an array of excellent features, all of which will improve your safety on any given drive. With the Lane Keeping Assist System, you’ll never have to worry about drifting out of your lane and into another vehicle, and with the Collision Mitigation Braking System™ you will be able to avoid an accident. Anyone in the market for a new family minivan should take a long, hard look at the Honda Odyssey, which provides top-notch features every family will appreciate. Take the 2018 Honda Odyssey for a test drive today by visiting Burns Honda. Burns Honda is the best dealership for consumers near Mount Laurel, Marlton, and Cherry Hill who are looking for a reliable vehicle. Our inventory is filled with excellent new and pre-owned models, and when you visit us, our team won’t stop working for you until all your automotive needs have been fulfilled. Contact us today!